A new feature has been added to the EAV Leaders Community Shop. Is only available in the EAV Leaders Community Shop. Requires that you be an EAV Leader to purchase. 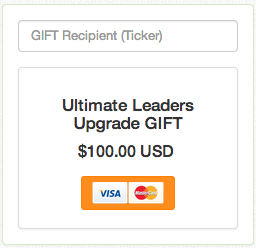 Requires you to enter a valid ticker of a member who does not already have the EAV Leaders package. Is only available for purchase through Stripe with a credit card. If you would like to give this gift to another Empire Avenue member, please check out the EAV Leaders Community Shop. Look for the icon below.